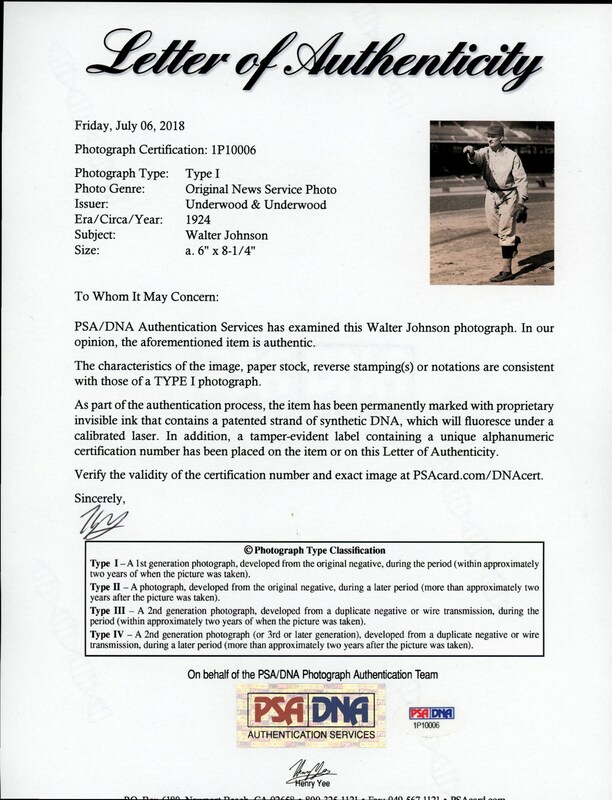 Presented here is a brilliant Underwood & Underwood 6" x 8" photo portraying the immortal Walter Johnson's pitching pose. Measuring approximately 6" x 8", this black & white dandy was issued on October 11, 1927, directly after the Washington Senators bested the Giants for the first World Championship. 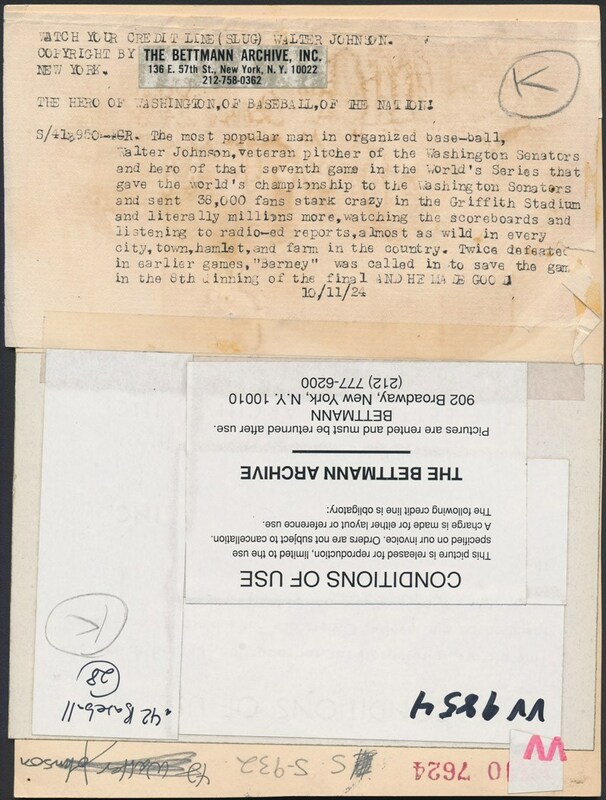 This World Series would mark both the Washington Senator's and Walter Johnson's only world championship, with Johnson fittingly the winning pitcher in the deciding Game 7 at Griffith Stadium. Led by four future Hall of Famers including player/manager Bucky Harris, the perennial hapless Senators had finally clinched an American League pennant via stellar seasons from Sam Rice, Goose Goslin and Walter "Big Train" Johnson. 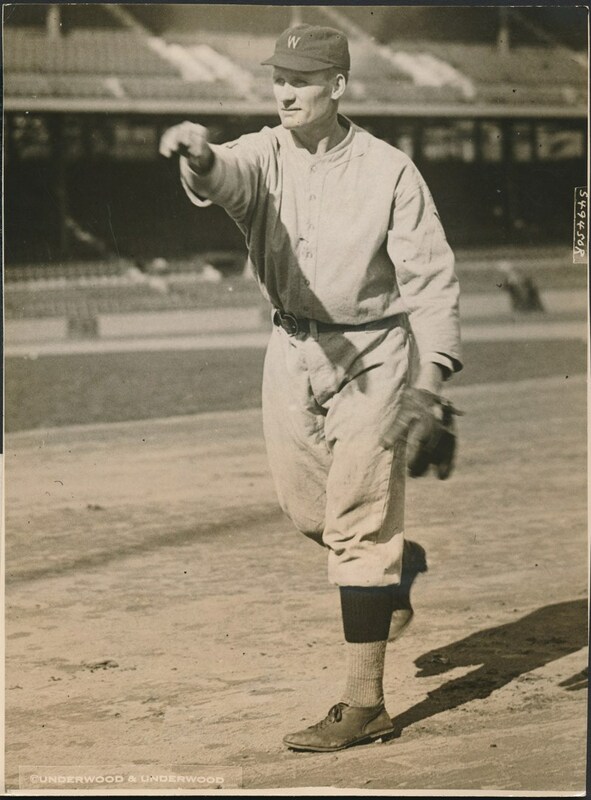 The John McGraw led New York Giants and Washington waged a fierce 6-game battle with each team claiming 3 wins apiece. In the deciding 7th game, trailing 3-1 in the bottom of the 8th, Bucky Harris stepped to the plate with runners on 2nd and 3rd and hit a routine ground ball that amazingly struck a pebble and bounced over 3rd baseman Freddie Lindstrom, scoring 2 runs and tying the game. The legendary Walter Johnson who had lost his two previous series starts came in to pitch a scoreless ninth inning, with the deadlocked game lingering on to the 12th inning. Johnson tossed his 4th scoreless inning in the 12th, and in the bottom of the inning, amazingly, Earl McNeely hit another bad-hop grounder that again scooted past Lindstrom to score Muddy Ruel with the series clinching run!